Here are the 2012 Results from the A' Design Award & Competitions' Survey on Design Awards and Competitions. For each question, I have provided also my professional insights in order to see what the results mean for the international design community, designers, brands and jury members of design competitions. How many design competitions do you join every year? It is as expected that most people join 1 to 2 competitions, however, there is also significant amount of people that join more than 10 competitions a year. 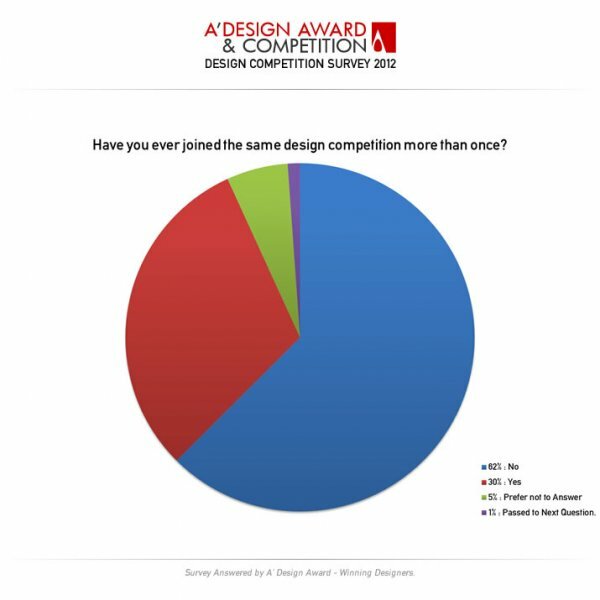 An interesting note that since 28 percent indicated they join no other competition; it means that 28 percent of the winners did not join any other design competitions free or paid. 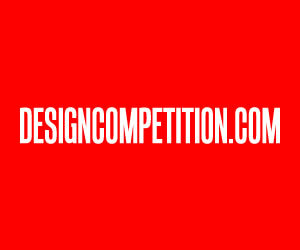 How many *paid* design competitions do you join every year? As not expected majority joins only a single award in a given year, while a quarter of the participants would join multiple awards. An interesting note that since 59 percent of winner designers indicated that they join no other paid competition than a design awards; it means that 59 percent of the winners see a different unique value proposition of the event. Are you a student or a design professional? 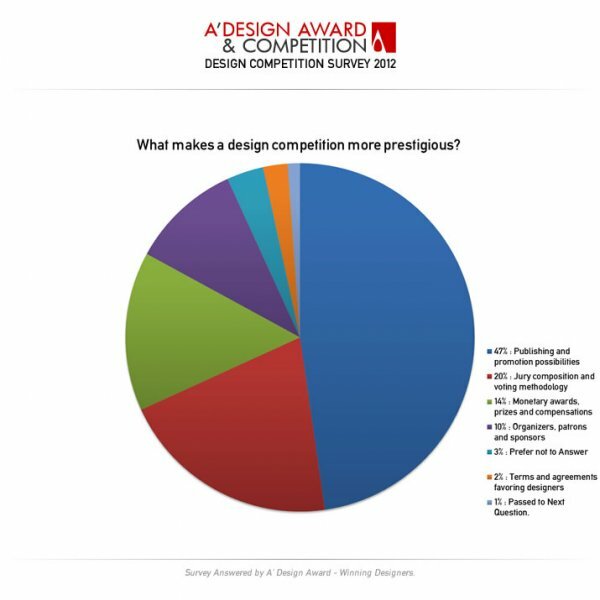 Survey results reveals that A' Design Award and Competition mainly attracts design professionals, while 12 percent are companies and brands. Students make only 21 percent of the contributions. 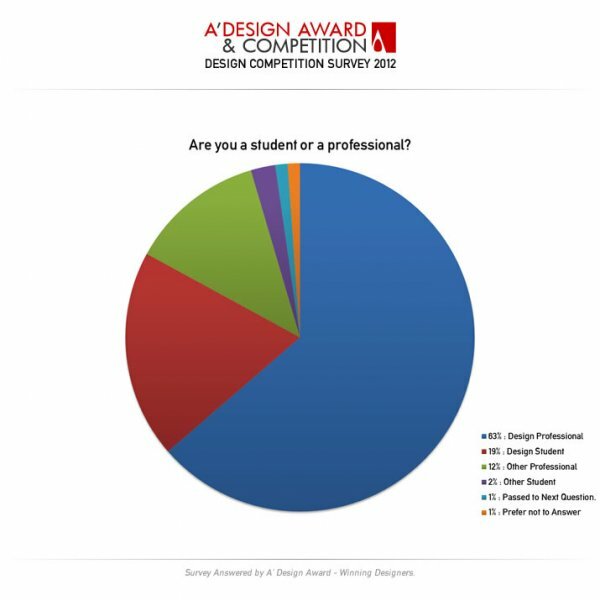 This shows that A' Design Award has positioned itself for professionals rather than design studios or companies. 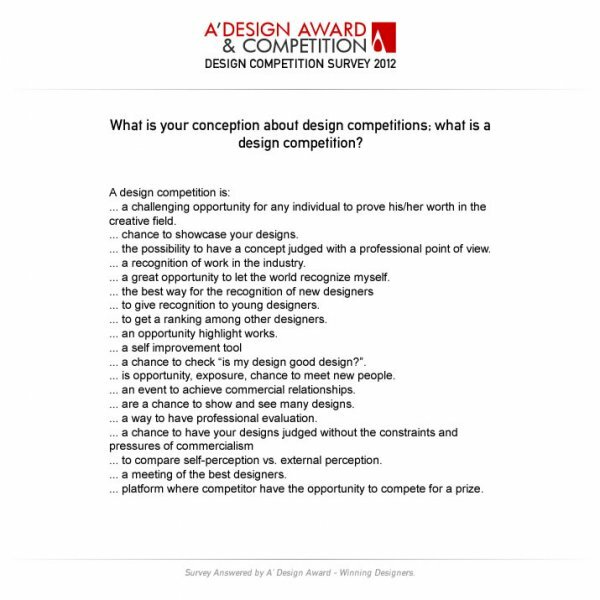 As a participant, which of the following do you expect firstly from a design competition? As expected majority is looking for a way to gain publicity, fame and recognition. 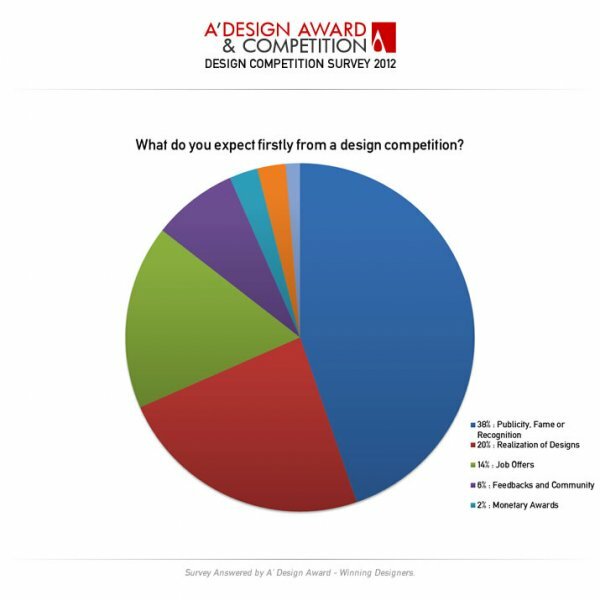 34 percent of the entries are looking for realization of designs or job or contract offers as a result of winning. A' Design Awards services for both publicity, and business exposure. 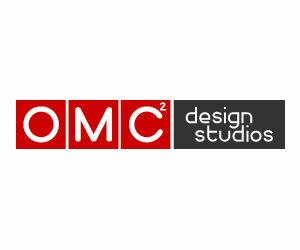 In your opinion as a participant, what makes a design competition more prestigious? 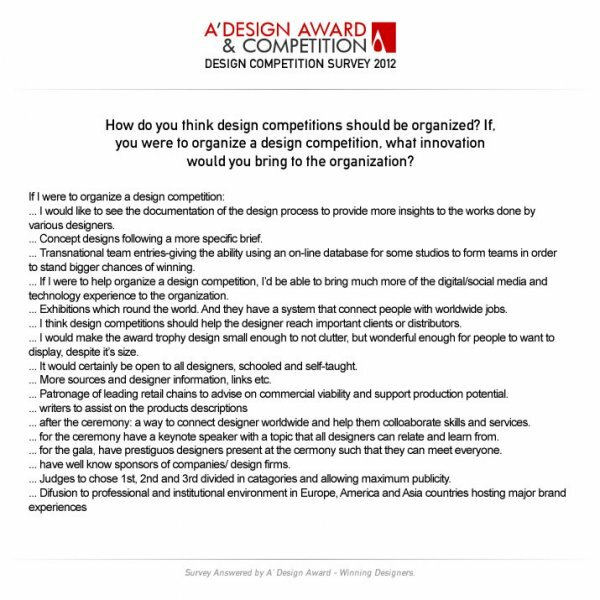 This is a striking information because the number of years the competition is organized does not get any mention here; Designers are mainly looking for publishing and promotion possibilities, and consider a competition prestigious if the jury is good. 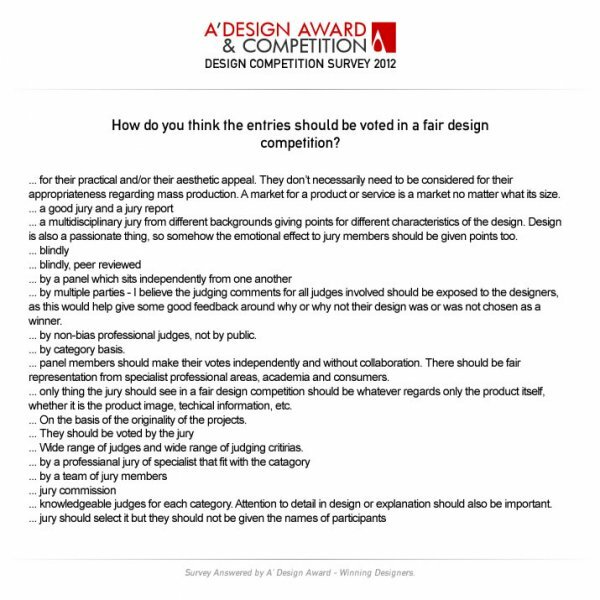 Do you read the terms and agreements of design competitions? This is an alerting result as 9 percent of the designers do actually admit that they do not read the terms. Furthermore 55 percent only skim the terms. Only 30 percent of the designers do carefully read the terms. This explains why most other competitions do have further-fee schemes or are able to legally transfer designs rights. Do you join a design competition with a single design or multiple designs? Most of the designers i.e. 62 percent would join with a single project, while 34 percent would submit multiple works. 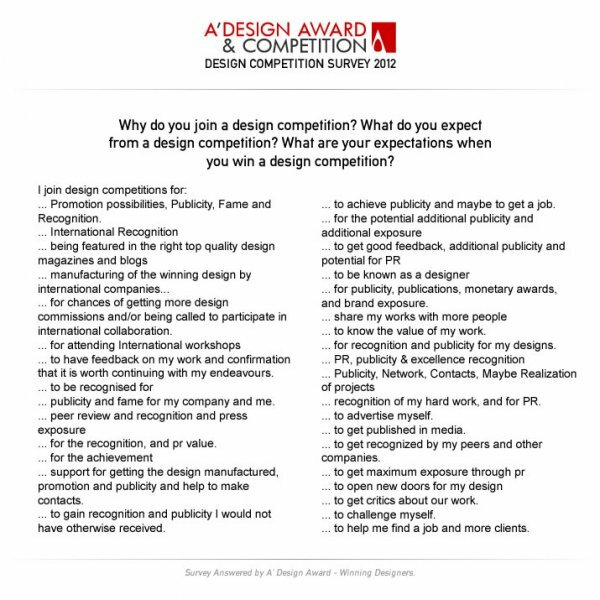 Since this table is filled by winners only, we can conclude that submitting multiple works is not required to win a design competition. Do you generally create new designs for design competitions or do you submit your existing works? 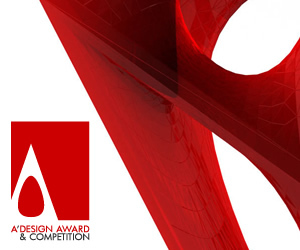 Majority of the participants who joined A' Design Awards submitted their existing works to the competition. 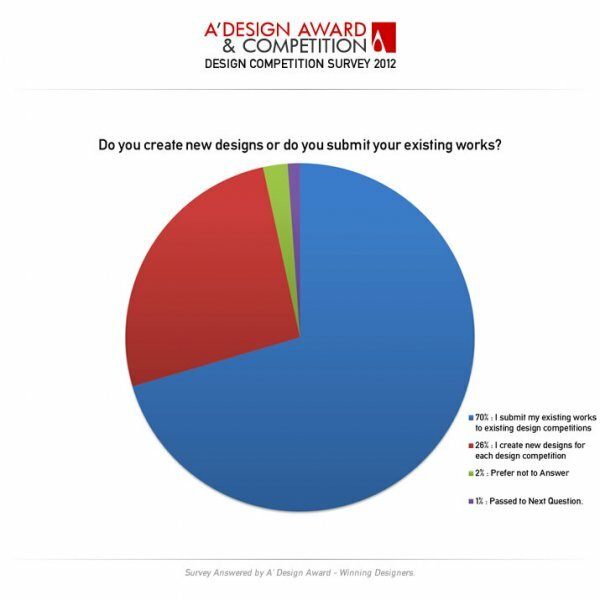 On the other hand 26 percent decided to design a new work; this could hint that design awards should provide a brief for participants who wish to design a new work. 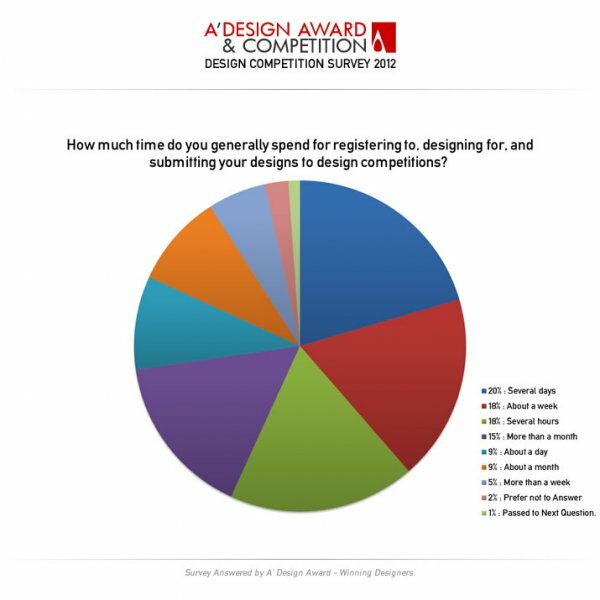 As a participant, how much time do you generally spend for registering to, designing for, and submitting your designs to design competitions? Most designers need only several days to take active part in a competition. 85 percent of the designers would finish the application and submission process within a month, thus it could be concluded that at least a month is required for designers to submit their works. 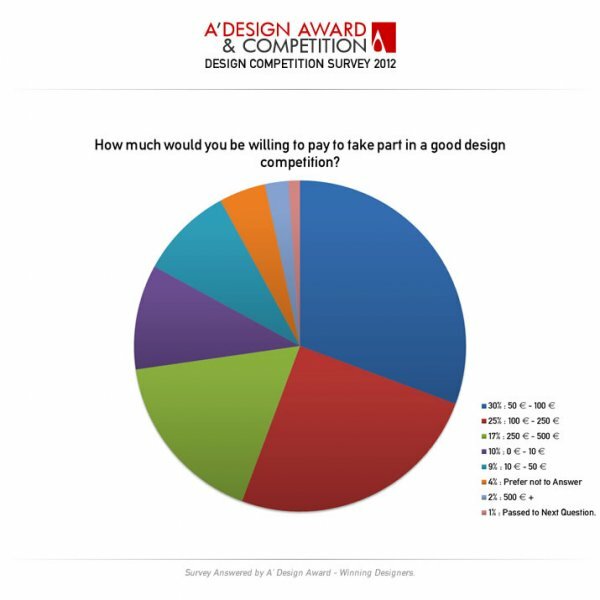 How much would you be willing to pay to take part in a good design competition? Majority of the participants: 55 percent stated that they want to invest up to 250 Euros. Only two percent of design professionals wanted to invest more than 500 Euros, and 10 percent of the participants did not want to invest anything at all. Does your company or institution covers your costs (time, money) for participating in design competitions? It is interesting to note that 22 percent of the winner entries were sponsored by patron companies or institutions, while 68 percent were sponsored by the participants themselves. 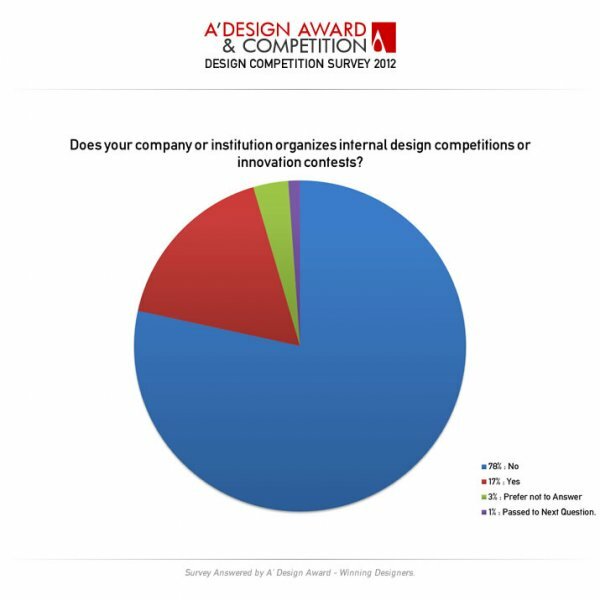 Does your company or institution organizes internal design competitions or innovation contests? This is a question that was asked to measure whether internal contests and events would spur creativity, interestingly, 17 percent of the winning designers come from organizations where internal design competitions are held. Have you ever joined the same design competition more than once? 62 percent of the designers indicate that they would not join the same competition twice, winner or not winner. This hints competition organizers to seek for new participants each year. While 30 percent do join same competitions in consecutive years. Do you think, briefs given in design competitions are good enough? Most people think that design competition briefs are good enough. While 22 percent is still a high number who state that briefs in competitions could have been better. This indicates that competitions should spend more time for designing a brief. Have you ever joined a design competition as a team? Interesting but true, 34 percent of A' Design Award winners stated that they join the competition as a team, indeed designs which have been made by teams rather individuals scored higher in the results; that is a hint that while personal creative input is important, having a design team could really improve the results. ... a challenging opportunity for any individual to prove his/her worth in the creative field. ... chance to showcase your designs. 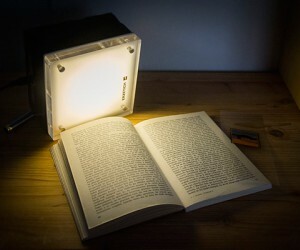 ... the possibility to have a concept judged with a professional point of view. ... a recognition of work in the industry. ... a great opportunity to let the world recognize myself. ... to give recognition to young designers. ... to get a ranking among other designers. ... an opportunity highlight works. 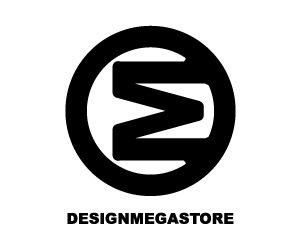 ... a chance to check “is my design good design?”. ... is opportunity, exposure, chance to meet new people. ... an event to achieve commercial relationships. ... are a chance to show and see many designs. ... a way to have professional evaluation. ... to compare self-perception vs. external perception. ... a meeting of the best designers. ... platform where competitor have the opportunity to compete for a prize. How do you think the entries should be voted in a fair design competition? ... for their practical and/or their aesthetic appeal. They don't necessarily need to be considered for their appropriateness regarding mass production. A market for a product or service is a market no matter what its size. ... A multidisciplinary jury from different backgrounds giving points for different characteristics of the design. Design is also a passionate thing, so somehow the emotional effect to jury members should be given points too. ... by multiple parties - I believe the judging comments for all judges involved should be exposed to the designers, as this would help give some good feedback around why or why not their design was or was not chosen as a winner. ... by non-bias professional judges, not by public. ... panel members should make their votes independently and without collaboration. There should be fair representation from specialist professional areas, academia and consumers. ... nly thing the jury should see in a fair design competition should be whatever regards only the product itself, whether it is the product image, techical information, etc. ... on the basis of the originality of the projects. ... Wide range of judges and wide range of judging critirias. ... knowledgeable judges for each category. Attention to detail in design or explanation should also be important. How do you think design competitions should be organized? If, you were to organize a design competition, what innovation would you bring to the organization? ... I would like to see the documentation of the design process to provide more insights to the works done by various designers. ... Concept designs following a more specific brief. ... Transnational team entries-giving the ability using an on-line database for some studios to form teams in order to stand bigger chances of winning. ... If I were to help organize a design competition, I’d be able to bring much more of the digital/social media and technology experience to the organization. ... Exhibitions which round the world. And they have a system that connect people with worldwide jobs. ... I think design competitions should help the designer reach important clients or distributors. ... I would make the award trophy design small enough to not clutter, but wonderful enough for people to want to display, despite it’s size. ... It would certainly be open to all designers, schooled and self-taught. ... More sources and designer information, links etc. ... Patronage of leading retail chains to advise on commercial viability and support production potential. ... after the ceremony: a way to connect designer worldwide and help them colloaborate skills and services. ... for the ceremony have a keynote speaker with a topic that all designers can relate and learn from. ... for the gala, have prestiguos designers present at the cermony such that they can meet everyone. ... have well know sponsors of companies/ design firms. ... Judges to chose 1st, 2nd and 3rd divided in catagories and allowing maximum publicity. Why do you join a design competition? What do you expect from a design competition? What are your expectations when you win a design competition? ... Promotion possibilities, Publicity, Fame and Recognition. ... for chances of getting more design commissions and/or being called to participate in international collaboration. ... to have feedback on my work and confirmation that it is worth continuing with my endeavours. ... publicity and fame for my company and me. ... for the recognition, and pr value. ... support for getting the design manufactured, promotion and publicity and help to make contacts. ... to gain recognition and publicity I would not have otherwise received. ... to achieve publicity and maybe to get a job. ... for publicity, publications, monetary awards, and brand exposure. ... to know the value of my work. ... for recognition and publicity for my designs. ... recognition of my hard work, and for PR. ... to get published in media. ... to get recognized by my peers and other companies. ... to get critics about our work. ... to help me find a job and more clients. 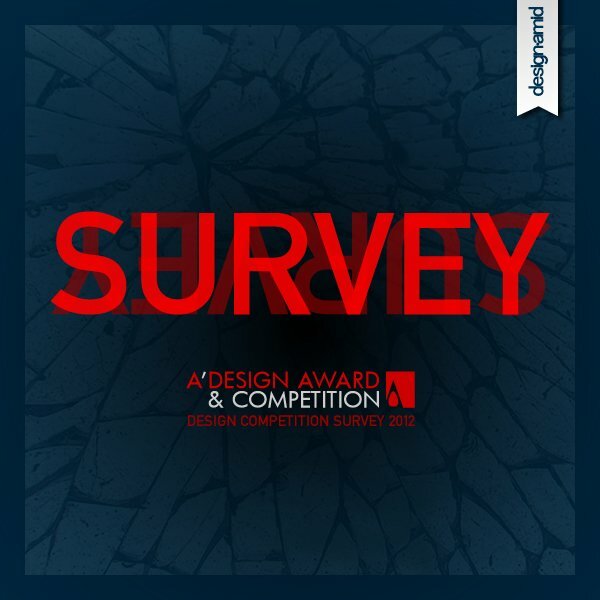 This article was added on Monday, 27th of January, 2014 at 05.26 am by author Onur Cobanli Tags: design competition survey, design award survey, survey for design competitions. Read our copyright policy here.